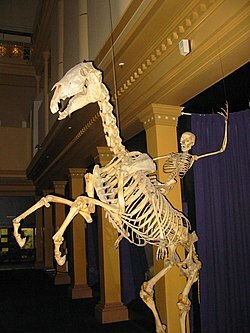 The skelets o a human an a horse placed in a display in the Australian Museum, Sydney. The skelet (frae Greek σκελετός, skeletos "dried up", )is the body pairt that forms the supportin structur o an organism. Thare are twa different skeletal types: the exoskelet, which is the stable ooter shell o an organism, and the endoskelet, which forms the support structur inside the body. Thare are an aa twa ither forms o skelet referred tae, the hydroskelet an the cytoskelet.